Shayna Fischer is a native of Wing, ND. 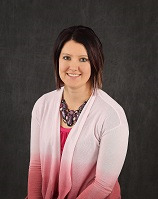 She graduated from Lake Region State College in 2011 with an Associate of Applied Science Paralegal Degree. In the fall of 2011, she began working as a legal assistant for partner Sheldon A. Smith and then associate David J. Smith. Shayna was promoted to Paralegal in the spring of 2015 and continues to work for partners Sheldon A. Smith and David J. Smith along with associate Tyler J. Malm. Shayna assists the attorneys and staff with various matters primarily focusing on civil cases including probate and business litigation.